Barathrum Centrata is the section of the Imperial Sewers directly beneath White-Gold Tower. It is the central hub of the public dungeon and connects the three sewer branches together. 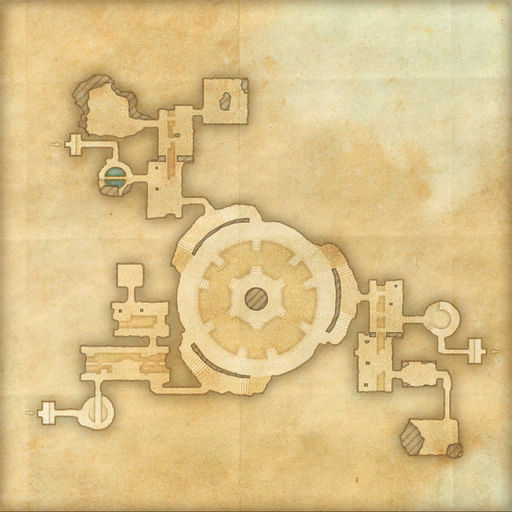 Access to the Dominion branch is through Weaver's Nest in the eastern section; access to the Covenant branch is through the Wavering Veil in the southwestern section; and access to the Pact branch is through the Alessian Tombs in the northwestern section. This section of the sewers is filled with portals to Coldharbour. 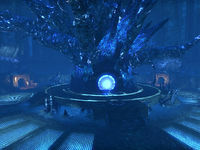 The three portals in the center will spawn random Xivkyn generals during the final wave, and closing all three will summon the Simulacrum of Molag Bal. Completing this event rewards participants with an achievement and a large amount of Tel Var Stones, as well as a chance to earn the Stonefire Scamp pet or Soul-Shriven Skin costume. It's important to note that a maximum of twelve players can earn the event reward; any more, and some members of your group will get nothing from the Simulacrum boss. This area is also called "Darkest Depths" in some hovertexts. Since the Xivkyn generals that spawn from the central portals are random, it is possible to encounter the same general multiple times. Barathrum centrata translates as "central pit" in Latin. This page was last modified on 17 January 2019, at 13:14.